It’s time I write about Notre Dame Cathedral in Amiens, since I put a pic of it on my homepage. 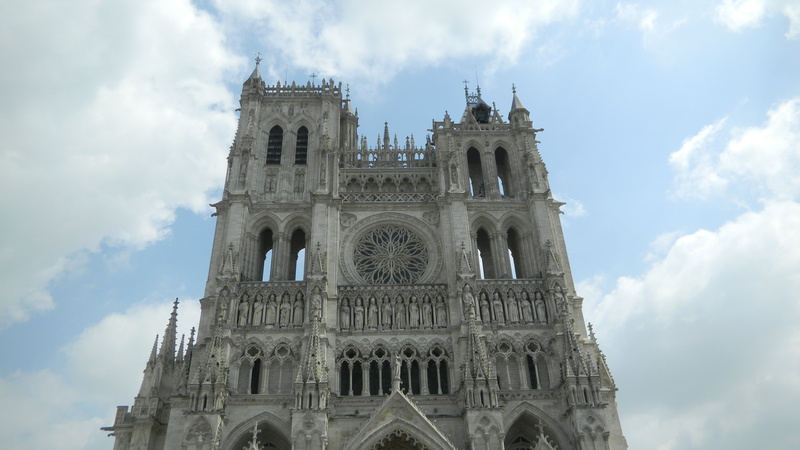 Of all the Gothic Cathedrals I visited, Notre Dame in Amiens was one of the most moving. I enjoyed it even more than Paris Notre Dame Cathedral. Here’s why. 1. 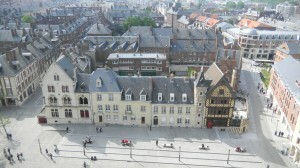 The town of Amiens had a long history before the cathedral was built. It presides in Picardy, about 70 miles north of Paris, on the Somme River. It had bishops since the 4th century. 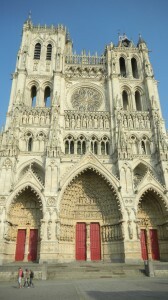 But Amiens suffered several disasters before the current cathedral was built. The Normans destroyed its cathedral around 900 CE, and another was torched in a fire that devastated the whole town in 1137. A new cathedral replaced it, but it too went up in flames, in 1218. 2. The present cathedral was begun in 1220. That was a great time to construct a Gothic building. Chartres Cathedral was begun in 1194, and its builders developed new standards in Gothic architecture, which were spreading through northern France. 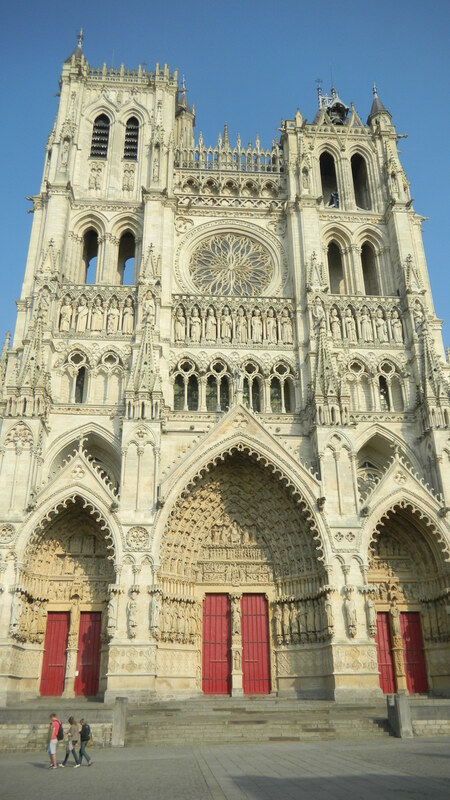 The builders of Amiens Notre Dame could implement Chartres’ design from scratch and refine it. Its parts are logically related to each other, and its vertical and horizontal lines balance each other. God’s ordered universe is set in stone. Paris Notre Dame Cathedral’s west facade is like this too, but Amiens’ seems much less massive. Amiens Cathedral is actually bigger than Paris Notre Dame (it’s longer, and it has a higher nave), but it seems more spiritual and gentle. 4. The Crusade of 1248-54, and a fire in 1258 delayed the construction. But like the 1218 fire, what seemed calamitous became a blessing. 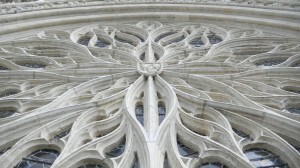 Innovations in Gothic architecture were growing into the Flamboyant style, which made forms more fluid and flame-like. The rose window in Amiens’ west facade (pictured above) is in this style–it replaced an older window around 1500. The west facade’s 2 towers were begun in 1366. But the flamboyant designs are less prominent than the cathedral’s distinct lines. The new forms don’t lessen the cathedral’s logical clarity. They make it even lighter and more spiritual. 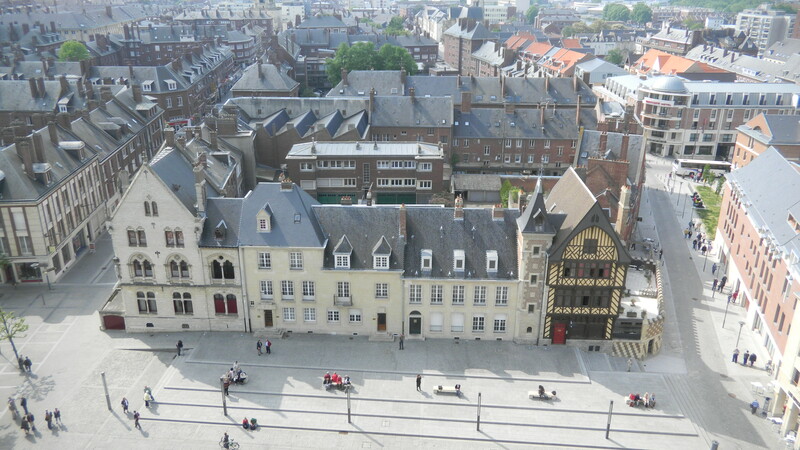 So, many fans of Amiens Notre Dame Cathedral think it’s the apex of High Gothic style. I had no arguement when I sat across from it in the little square in the afternoon and watched the west facade reflect the sun. A few local elderly men and women shared the benches and placidly discussed the day’s affairs–the cathedral’s serene order seemed to radiate through the town. 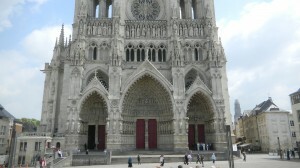 After Amiens’ early disasters, the cathedral has given it peace. What a contrast with the exuberant design of the Bayon in Angkor. The Bayon expresses overwhelming energy, but Amiens Notre Dame expresses the West’s love of linear relationships and permanent ratios. Two equally great buildings from 2 very different cultures. But you haven’t really seen how great Amiens Cathedral is until you’ve seen its interior.